What do you shoot for? 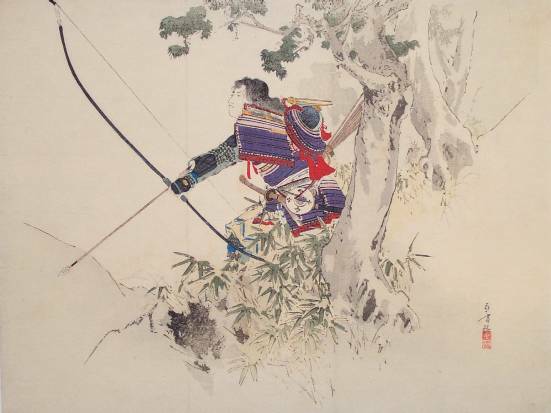 For as long as he could remember, all Saito ever wanted to do was become and expert kyudo archer in the service of his lord. For ten years, since he was only three years old, he had been practicing with a bow. Soon he would be old enough to join his father in the Daimyo’s fighting forces. One afternoon, Saito was in a meadow outside town shooting with two of his friends. The meadow was ideal because it lay at the base of a tall cliff. If the arrows missed the target, they would bounce off the cliff and not be lost. The boys took turns naming a target and trying to hit it. Saito was happy. Nothing made him feel better than the sound of his arrow hitting the target, and that day his arrows were hitting nearly every time. As the boys practiced, a stranger walked by on the road. He spotted the three friends, waved, and stopped to watch for a while. Saito loved an audience. He winked at his friends and quickly – one, two, three – put three arrows into a tree he was shooting at. “That’s very accurate shooting,” the stranger called out as he walked toward the boys. “Yes it is!” said Saito. The stranger raised an eyebrow at Saito’s reply, “Are you always that accurate?” he asked. “Mmmm,” said the stranger, neither agreeing nor disagreeing. “Let’s see you hit that tree,” and he pointed to one about fifty feet away. Saito set the arrow on the string, pulled it back, and without even a pause for aim, released it. The arrow flew and pinned the cloth to the tree. “That was easy!” Saito said. :Let me do a harder one.” He scanned the meadow until he saw a rock sticking up a few feet above the grass. Trotting off, he climbed atop its slippery surface. Perched atop it he fitted another arrow, fired, and hit the cloth again squarely. “I get to choose where you stand,” said the stranger. Saito grinned as he thought of his new bow. He bowed to the stranger and accepted the bet. The three boys were huffing a puffing by the time they reached the top of the cliff. The looked down over the meadow they had just been in, down over the town and the surrounding area. Saito saw the target tree about seventy five feet below him. The trunk was clearly visible. The stranger had underestimated him. He’d shot from heights like this before. It would be no problem hitting the trunk from this distance. “That new bow is a good as mine!” he whispered to his friend, who smiled back and nodded. “All right,” said Saito, pulling an arrow from his quiver and setting it on his string. He was about to pull back when the stranger put a hand on his shoulder. “Wait,” he said. “Remember, I get to choose where you stand.” Saito returned the arrow to the quiver. The stranger walked along the edge of the cliff, obviously looking for something. A small, flat boulder caught his attention. He nudged it with his foot and it rocked ever so slightly. He stepped up onto it and it shifted and slipped. Saito caught his breath, fearing it would topple over the edge. It held, but barely. The stranger stepped down. “Yes,” the stranger said. “there is the whip of the string to consider. But it would be no different from the shot you took from on top of the rock down there.” Saito’s eyes again went to the meadow. It seemed to swim below him. Carefully he edged his second foot into place. Slowly he drew his bow. The wind gusted. Saito scrambled back to safety. “It was a silly bet in the first place,” he muttered, putting down his bow and arrow. Saito nodded and handed him the bow and an arrow from his quiver. The stranger bowed deeply as he received it. He turned, walked over the edge of the cliff, and climbed on top of the boulder. Carefully, he drew back the bow, then paused and waited. Almost imperceptibly, the string released itself. It whipped against the upper part of the bow with a crisp, clear sound, and the arrow flew. Saito and his friends stepped to the edge of the cliff and cautiously peered down. There was the arrow, protruding out of the exact center of the tree trunk. Something to think about…When you train, what do you shoot for? Next PostThere are no secrets in martial arts, only undiscovered truths.